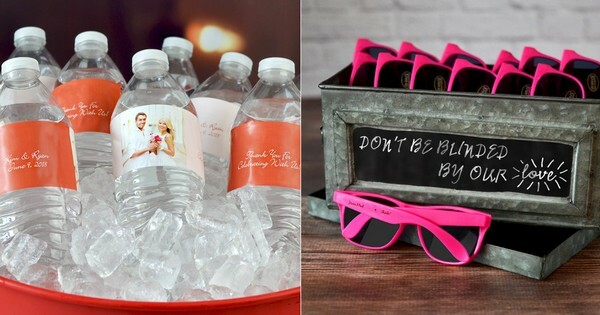 Shop fun and functional guest gifts, reception favors, and decorations for your outdoor wedding this summer including personalized sunglasses favors, custom printed water bottle labels, plastic cups, folding hand fans and more. Don't let your love be blinded by the sun during your outdoor wedding ceremony and reception. Create a sunglasses station for guests to pick up a pair of sunglasses custom printed with the bride and groom's name and wedding date to keep the glare away from every aspect of your wedding day. You can also designate an usher or server to pass out the sunglasses to guests as they arrive. Keep guests cool indoors and out this summer with folding hand fan favors. Affordable and portable, hand fans are perfect for guests to use during your ceremony and reception on those blistering hot summer afternoons. Quench guests' thirst with ice cold bottles of water personalized with custom printed, waterproof labels featuring a design to compliment your wedding theme, the bride and groom's name and wedding date. 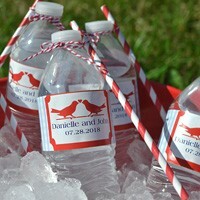 Water bottle labels are an inexpensive reception decoration detail that will really stand out. 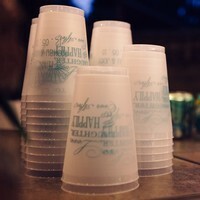 Plastic cups personalized with a design and up to 4 lines of custom print make awesome wedding souvenirs guests love to take home. Stack cups next to your outdoor drink station, beer bar, or cocktail area. These are just a few of many great outdoor summer wedding favor and decoration ideas to add that little something extra that guests will notice and appreciate.